Phobos is a mod for Doom 3 that aims to show a different side of its universe during the initial disaster that brought demons to our dimension. It’s been in development – in some form or other – since Doom 3’s release back in 2004, and now it has finally released its first episode. You’ll take the role of an unnamed protagonist, but who is also a complete character with a past, present, and future, according to the mod’s website. Waking up in a repurposed apartment in Mars City with no memory of how you got there, you meet Samantha Miles, who claims to represent a global conglomerate of Earth and offers to help rediscover your past. The events of Doom 3 are occurring at around the same time. 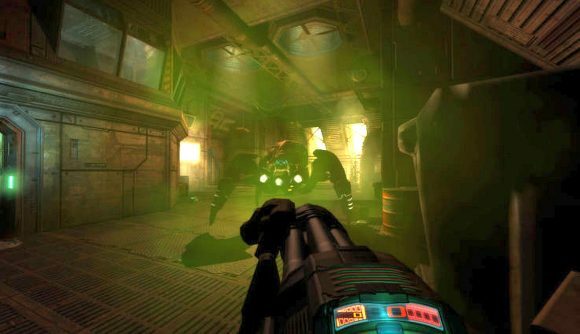 Note that Doom 3 ignored the events of Doom 1 and 2 and was the series’ first reboot – though the essential premise, of misguided scientists opening a portal to Hell, remains the same. A gameplay trailer, released in May this year, does a pretty good job at setting the tone. With a shopping mall, and a transit system and office corridor that feel very Half-Life, there’s a clear attempt to depict aspects of civilian life on these distant colonies. You can download Phobos from ModDB here (via DSoGaming). On that same mod page you’ll also find several dev blogs chronicling its lengthy development and discussing Team Future’s goals for the mod in more detail.